We are on a cusp of a chatbot revolution that will be extremely important to human culture. Chatbots are already everywhere. As some of the chapters in this book detail, they are present in e-commerce, banking, health care, education and libraries. This book consists of two sections. First of all, a run through the history of chatbots, some thoughts about the future, and an examination of how chatbots are changing cultural activity in all sorts of spheres. This section addresses Machine Learning, Natural Language Processing and Artificial Intelligence. Part 2 is all about building your own chatbot, which is easy to do and no longer requires any coding skills. There are several platforms that allow you to intuitively create chatbots for free. 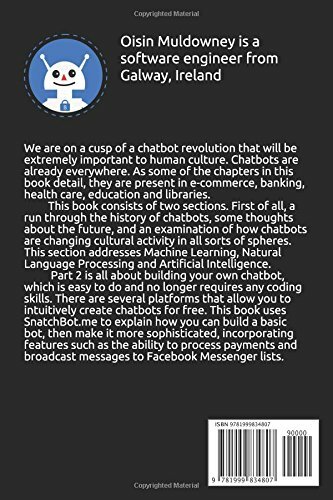 This book uses SnatchBot.me to explain how you can build a basic bot, then make it more sophisticated, incorporating features such as the ability to process payments and broadcast messages to Facebook Messenger lists.